You can book yourself a tour around the Caribbean and South America stopping in three places for only 64,500 miles total with half the trip in a flat bed. By stopping in three places, I am referring to actual destinations, not connections that have to be under 24 hours. This incredible deal relies on piecing together four sweet spots awards into one big trip. Even if you never take a trip like this, you should know about these sweet spot awards. However the price is the same no matter where your home airport is, and no matter where you choose your destination in Southern South America to be. You can tweak the route to your liking and keep the same prices as long as each destination falls in the right region for the pricing of the award. American Airlines post-devaluation award chart has flights to Central America, Mexico, and the Caribbean during the off peak season priced at just 12,500 miles one way in economy. It costs 4,500 British Airways Avios to fly from from Aruba to Bogota, Colombia on LAN in economy. Where to search for award space: ba.com. Here’s how to search ba.com. This route has the worst award space in the post, so if you copied this routing, you’d build the trip around award space on this leg. You can pick a place with better award space to Bogota (or wherever you decide to go), but the Avios price will probably be higher. Aruba to Bogota is only 605 miles flown, so it is the cheapest price of 4,500 Avios. Flights 651-1,150 miles flown are 7,500 Avios and something like Cancun to Bogota is 10,000 Avios. How to Book: on ba.com. For 12,500 Singapore or American Airlines miles you can fly from Bogota, Colombia to Rio de Janeiro, Brazil on Avianca/TACA (if using Singapore miles) or LAN (if using American Airlines miles). You could book the same flights in Business Class for 20,000 Singapore miles, or 25,000 American Airlines miles. Where to search for award space: If using Singapore miles, united.com. Here’s how to search united.com. If using American Airlines’ miles, ba.com. Here’s how to search ba.com. Award space is very good on Avianca’s direct Bogota to Rio flight, especially in Business Class. How to Book: If using Singapore miles, on singaporeair.com. If using American Airlines miles, call American Airlines’ AAdvantage customer service at 1-800-882-8880. It costs 35,000 Asiana miles to fly Business Class on Copa Airlines, Avianca, United, or Air Canada from Southern South America to the United States. 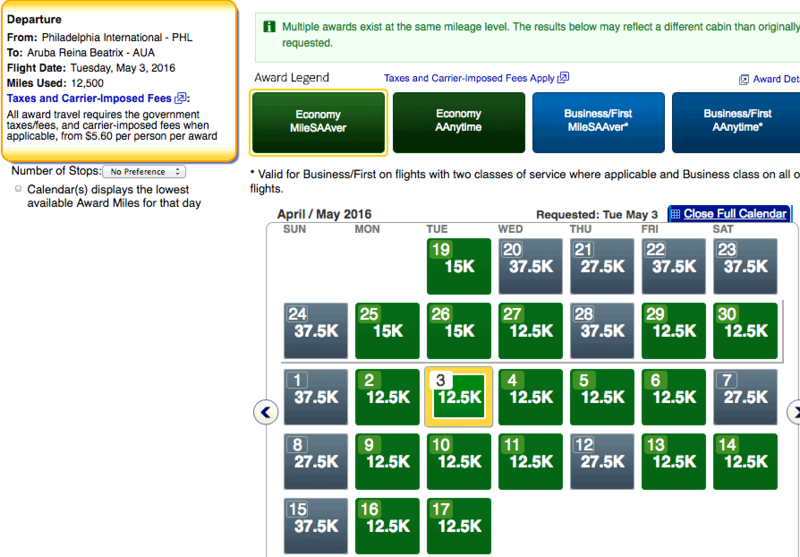 I booked Los Angeles to Santiago, Chile in Copa Business Class for 35,000 Asiana miles this year. Where to search for award space: united.com. Here’s how to search united.com. There is great award space between Rio and Philadelphia. How to Book: call the Asiana Club at +1-800-227-4262. What Do Those Awards Add up to? Or, if you wanted to fly the leg between Colombia and Brazil in Business Class, it would cost 72,000 using Singapore or 77,000 American Airlines miles. Consider it from this angle as well. Heading southbound, you spent only 12,500 + 4,500 + 12,500 = 29,500 miles/Avios, and you visit three places. Normally a one way award to Southern South America would cost 30,000 American Airlines/Delta/United miles, and no stopovers would be allowed. Why are There No Fuel Surcharges Mentioned in This Post? Because fuel surcharges are not levied on any airline, on any ticket, w the Americas that I am aware of. Great news for our mega-trip! The Citi® / AAdvantage® Executive World Elite™ MasterCard® comes with 50,000 bonus American Airlines miles after spending $5,000 in the first three months. The Citi Prestige® Card with 40,000 bonus ThankYou Points after $4,000 in purchases made with your card in the first 3 months the account is open. The Starwood Preferred Guest Credit Card by American Express, personal and business versions, both are offering 25,000 Starpoints each for spending $3,000 and $5,000 respectively within three months of the accounts opening. British Airways Visa Signature card by Chase is offering 50,000 Avios for spending $2,000 within three months of the account opening. If you have some (emphasis on some, not many are needed!) American Airlines, Singapore, and Asiana miles as well as a few British Airways Avios, you can piece together an amazing multi-award trip that spans all over the Caribbean and South America with three different destinations. It would be a great way to use up smaller amounts miles hanging around in your frequent flyer accounts, leftover after larger redemptions. Previous articleDo American’s Post-Devaluation Sweet Spots Have Award Space? These Four Do! BRILLIANT POST! This is why I read your blog. You have really good ideas. Aruba is especially good choice during the low season since it is outside the hurricane belt. Using avios to jump region boundaries in this case is perfect. In case you need inspiration for a new post….you could do something similar USA-EU-MDE with IST-AMM avios segment to jump boundaries in off season. Good idea. I’ll write it up. great job Scott! I just hope you are writing by the time my kids are old enough for me and my wife to disappear for 2 or 3 weeks. Love this post — these are the types of routings I’d love to incorporate into my 1 year trip around the world. Starting in SE Asia, but want to venture into Central and South America as well. Thank you for contributing such awesome content! See http://www.milevalue.com/how-to-book-a-rtw-trip-in-2015-use-these-underpriced-awards-around-the-world/ although I need to update that post. Thanks, that looks like a great resource! I had nearly two million miles and points saved up for this trip and already have some great redemptions booked such as LAN Peru business lie flat to Peru, AA business lie flat to Spain, Cathay first to Thailand, Cathay business for a visit back home 3 months later, Cathay business back to Asia with my girlfriend, and Cathay business back home 2 months later with my girlfriend. Looking into using my United miles (132k miles)+Chase UR (300k points) to take advantage of the free stopover and open jaw that United allows (maybe some hopper flights?). Looking at also transferring 40k Starpoints to Asiana based on your post today about Lufthansa First from Scandinavian countries connecting via Frankfurt back to the US. Purchased 136k Choice points during daily getaways to use in Scandinavian countries, so that would be a perfect complement. I’m currently checking out your “anatomy of an award” and “best of” categories on the blog to see what else I can find. Thanks again for the great resources. Korean LAX-GRU has YQ. ITA Matrix says otherwise, but KE charges it in LAX-GRU direction only and not reverse. It’s $65 (the one-way is $89 after taxes).